Everyone is familiar with Teflon, Teflon is one of product from fluoropolymer and fluoropolymer was widely used in many aspect of our life, such as for housewives when cooking, for automotive in air brake systems, and air compressors, for Aircraft in hydraulic hose and tubing hose, for chemical processing in chemical transfer hoses and flexible connectors, and many other utilizing. 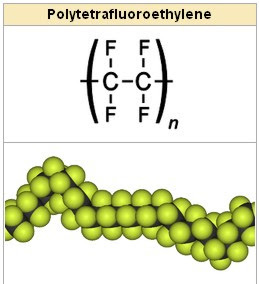 Actually, Teflon is trade name of DuPont for polytetrafluoroethylene (PTFE). PTFE is one of a synthetic fluoropolymer of tettrafluoroethylene which have much utilization. Fluoropolymer is not only PTFE (Teflon), there are any other fluoropolymers such as FEP (Neflon), PFA (Hyflon), ETFE (Tefzel, Neoflon), ECTFE (Halar), PCTFE (Kel-F), PVDF (Solef, Hylar, Kynar). Fluoropolymer has been discovered nearly 70 years ago and has been used for over 40 years. Fluoropolymer was discovered accidentally by Roy Plunkett at 1938 while Plunkett was attempting to make a new CFC refrigerant, the perfluorethylene polymerized in its pressurized storage container. Why Fluoropolymer is important for many utilization? Fluoropolymer has exceptional heat resistance at high degree temperature; fluoropolymer is also very inert to other solvent, mineral acids, bases, and organics. This inertia feature makes fluoropolymer very suitable for many tools such as cookware that always was used for cooking food. Fluoropolymer is also has Unequalled Corrosion resistant, although fluoropolymer is always in high degree temperature and mineral acids environment, fluoropolymer high resistance for corrosion. Many other characteristic of fluoropolymer which make fluoropolymer is always used in many tools and has special resistance than other polymer. How safe PTFE (Teflon) and Fluoropolymer coating? Many Teflon and other fluoropolymer coatings are permitted to use in contact with food, in compliance with the Federal Food, Drug, and Cosmetic Act and applicable regulations, including 21 CFR 175,300. US Environmental Protection Agency also stated "At the present time, EPA does not believe there is any reason for consumers to stop using any products because of concerns about PFOA". PFOA is stand for perfluorooctanoic acid (PFOA), a chemical compound used to make Teflon. Actually, there are many excellent manufacturer of fluoropolymer such as Fluorotherm. In 16 years operating, Fluorotherm always make innovation and research for fluoropolymer products. Under Aegis of Norton Performance Plastics, now ST.Gobain Performance Polymers, Fluorotherm is started out as specialty manufacturer of fluoropolymer. Strong background in polymers is always hoping make another breakthrough and innovation in fluoropolymer products.